It's been almost 40 years since I received the best piece of advice a Dad could give his daughter though I didn't know it at the time. My Dad told me not to limit myself to the decisions he made. (I'm not sure why, but that day I wanted to be a loan manager just like him.) He said I could do whatever I wanted with my life. At the time I was disappointed and thought it to mean he didn't wan't me to be like him. Through the years, I've come to feel the meaning of his words and to live by them. I've owned a silver and blue flamed racing motorcycle, learned to program computers, written a book (then five more), sewed my own wedding dress and chosen to be a barely mediocre cook. If there are instructions, consider it done. If there aren't, it will take me a little longer. 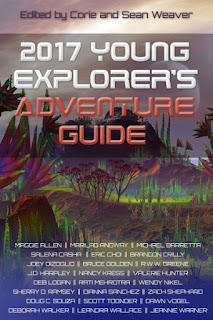 It has taken reading the third instalment of the Young Explorer's Adventure Guide to put my finger on what I love so much about these collections. They do mechanics. They do captaining starships. They do science. They also do compassion and friendship and bravery and anything else you can imagine. And many, many of them have a parent like my own who made sure they grew up knowing that doing is a good thing. 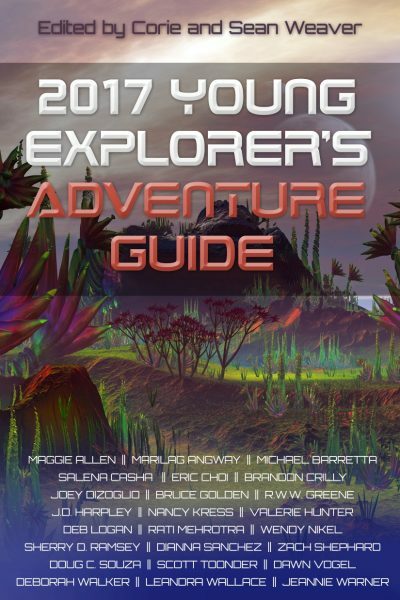 The Young Explorer's Adventure Guide swells with limitless character, personality, charm and young explorer angst. For an adult reader, these stories encapsulate the real feelings we have inside when we're stuck being grown up. This alone makes this book a treasure for young readers. I'm thrilled the 2017 edition meets the bar set by the first two editions. I was also very happy to see old friends from previous editions, Nia, Captain Dodger and Olivia, and get to know plenty of other young adventurers. I continue to be a fan and recommend this book for everyone.